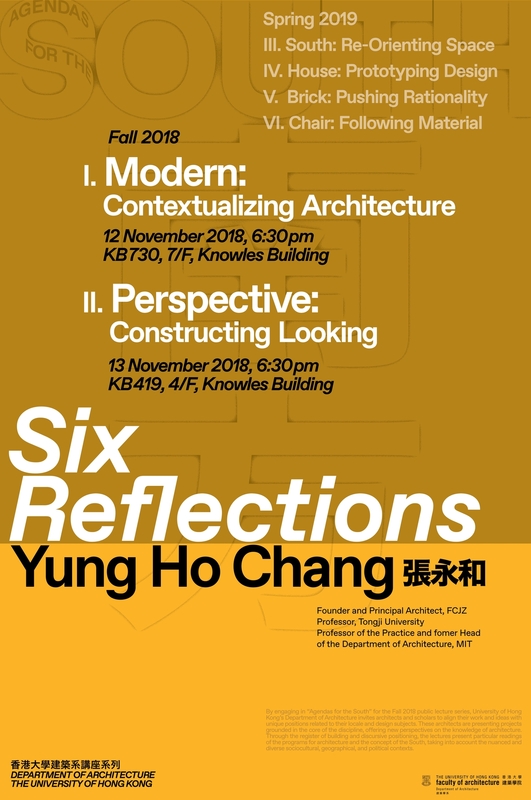 During the academic year 2018-19, Professor Yung Ho Chang will visit HKU for a series of six talks on architecture. 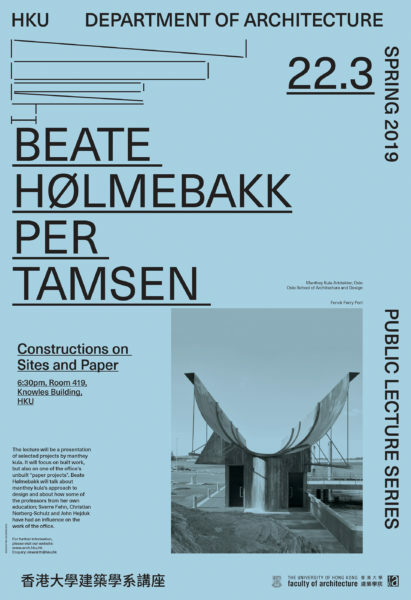 A talk on establishing a context for modern architecture in cultural terms beyond narrow formal definitions. 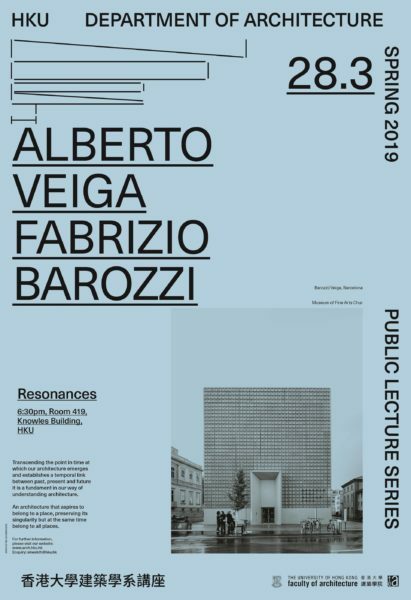 A discussion about architectural drawing focusing on perception of space and perspectival inventions. Studied in both China and the US, Chang received a Master of Architecture degree from the University of California at Berkeley in 1984 and has been practicing as Atelier Feichang Jianzhu (FCJZ) with Lijia Lu in China since 1992. FCJZ’s work ranges from architecture, urbanism, landscape, interior, to furniture, product, clothing, jewelry, stage, exhibition and art installation. 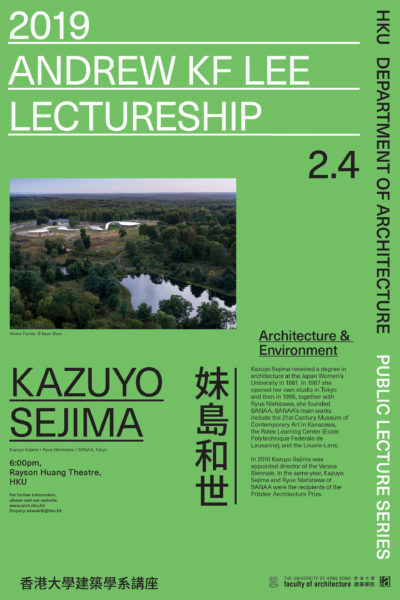 Chang and FCJZ have received a number of prizes, such as First Place in the Shinkenchiku Residential Design Competition in 1987, a Progressive Architecture Citation Award in 1996, the 2000 UNESCO Prize for the Promotion of the Arts, and the Academy Award in Architecture from American Academy of Arts and Letters in 2006, 2016 China Architectural Media Award Achievement in Practice Prize, and won the design competition for Fondation de Chine a la Cite Universitaire de Paris with CAAU. Chang has published several books and monographs, including Graphic FCJZ , Yung Ho Chang Draws，Yung Ho Chang Writes, The Little Detective in Chinese/English, Yung Ho Chang / Atelier Feichang Jianzhu: A Chinese Practice in English/French, Yung Ho Chang：Luce chiara，camera oscura in Italian，Pingchang Jianzhu, and Feichang Jianzhu, etc. They have participated in many international exhibitions of art and architecture, including six times in the Venice Biennale since 2000. FCJZ has held solo exhibitions of its work at Apex Art in New York in 1999, Harvard GSD in 2002, Chambers Gallery in New York in 2005, and MIT in 2007 and was invited to create an installation Poly & Chai in the central court at Victoria & Albert Museum in London in 2008. In 2012, FCJZ held a milestone retrospective at UCCA in Beijing entitled Yung Ho Chang + FCJZ: Material-ism. In 2016, FCJZ held a major solo exhibition at PSA in Shanghai entitled In The Name of Architecture: Pan-Design Practice of Atelier FCJZ. 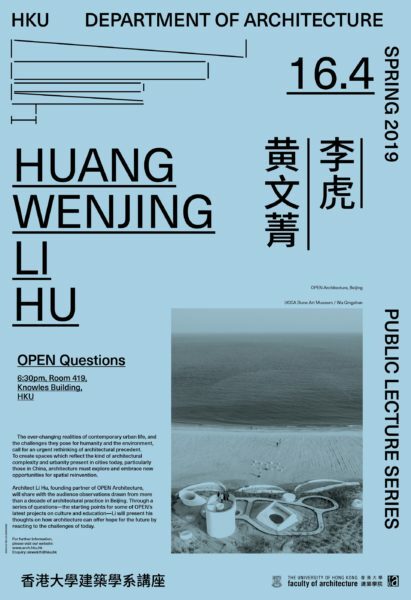 Chang also curated/co-curated the 1st Shenzhen Biennale of Urbanism and Architecture in 2005, the China Pavilion at Venice Biennale in 2008, and the 1st West Bund Biennale of Architecture and Contemporary Art in Shanghai in 2013. Products, architectural models, and installations by FCJZ are in the permanent collection at V&A, Echigo-Tsumari Land Art Triennale in Japan, National Art Museum of China in Beijing, He Xiangning Art Museum in Shanzhen, and M+ in Hong Kong. 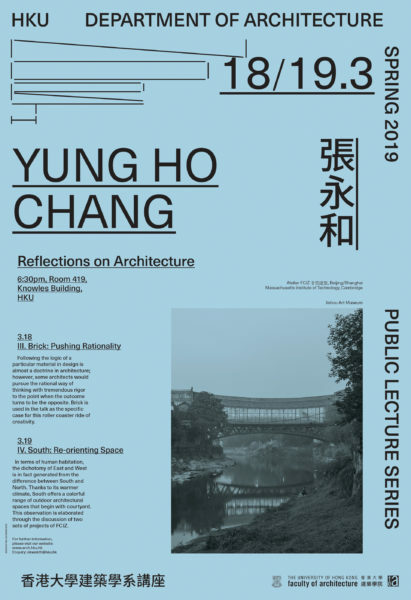 Chang has taught at various architecture schools in the USA and China; he is presently a professor at Tongji, PKU, and MIT where he served as the head of Architecture Department from 2005 to 2010, as well as Honorary Professor at HKU. 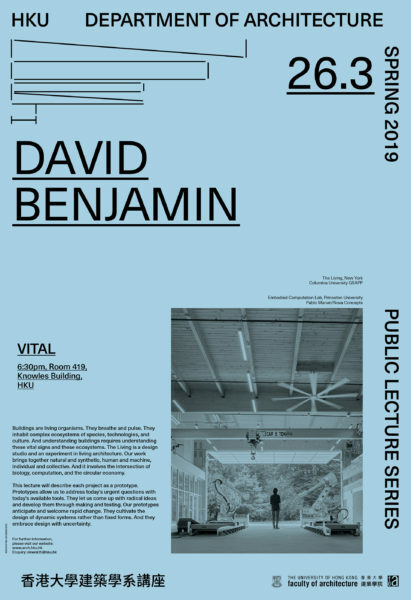 He founded the Peking University Graduate Center for Architecture in 1999, and held the Kenzo Tange Chair at Harvard in 2002, the Eliel Saarinen Chair at Michigan in 2004, and the Howard Friedman Chair at Berkeley in 2016. 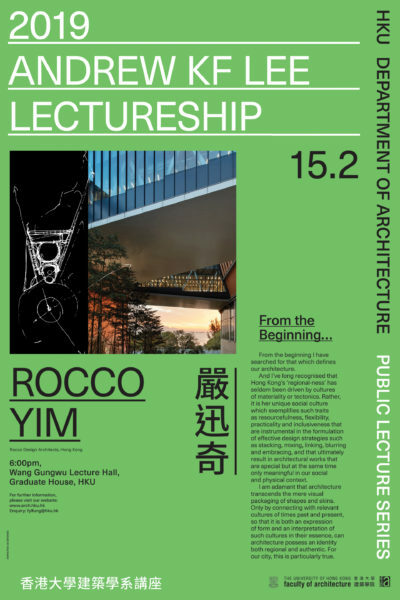 In 2009 he was bestowed the honorary membership by AIA Hong Kong. He was a Pritzker Prize Jury member from 2011 to 2017. 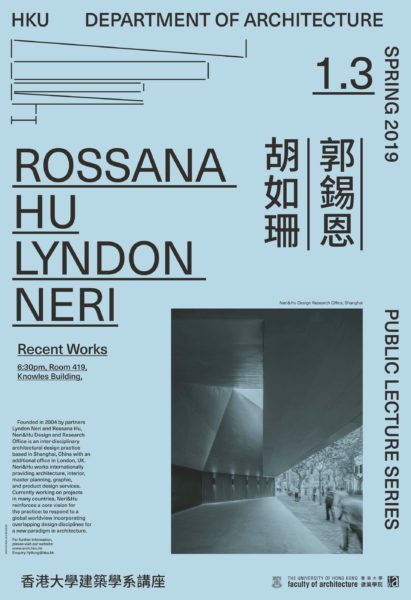 By engaging in “Agendas for the South” for the Fall 2018 public lecture series, University of Hong Kong’s Department of Architecture invites architects and scholars to align their work and ideas with unique positions related to their locale and design subjects. 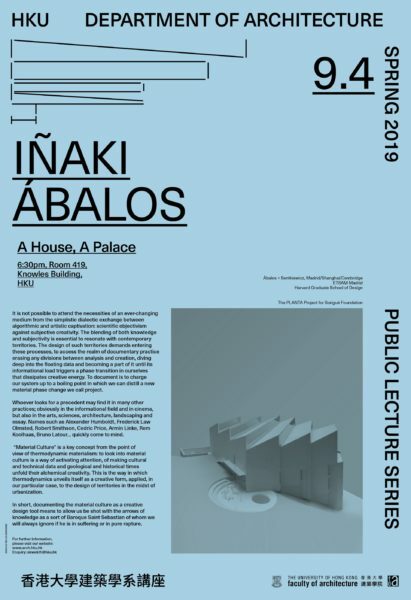 These architects are presenting projects grounded in the core of the discipline, offering new perspectives on the knowledge of architecture. 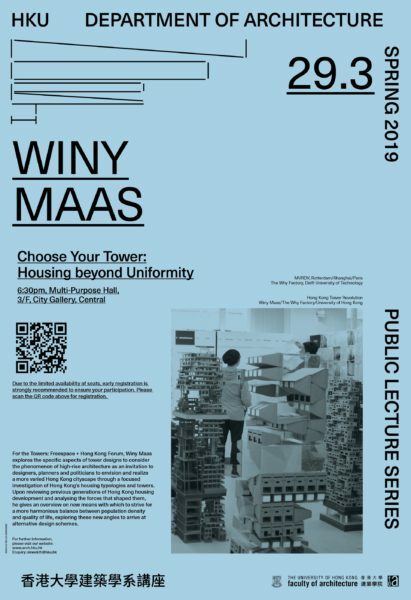 Through the register of building and discursive positioning, the lectures present particular readings of the programs for architecture and the concept of the South, taking into account the nuanced and diverse sociocultural, geographical, and political contexts.